An assessment of existing conditions illustrates site constraints : This residence was a typical ranch home with an underused and undesirable basement on an attractive lot. The excavating and mounding of earth created dynamic levels on an otherwise flat landscape. The initial sketch plan conceived of two overlapping layers: a lower walled court (above) and an upper deck with catwalk (below). The owners of a simple ranch home in Berkshire County faced a dilemma: should they purchase a new home or building site, or renovate their home to better suit their needs? Their home is a regular weekend destination for family and friends. They loved their property and believed that its landscape character and location would be difficult to duplicate, particularly given the dramatic increase in property values regionally. Their decision to renovate was the most feasible option. 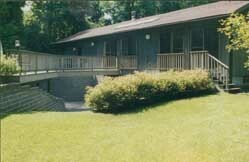 The existing deck, though large, was southwest-facing, uncomfortably hot in summer, and shading the yard space below. As a result, the lower space, which provided access to basement family and guest rooms, was moldy, mossy, damp, and dark. The goal of this project was to make the lower floor prime usable space while strengthening the link to the private south yard. Constrained by a modest budget, interior and exterior intervention needed to be carefully integrated. The resulting concept was to “dig and mound.” The first step was to remove the existing deck. Then, by excavating a broad, open and gently ramped space adjacent to the basement, a sunny, airy outdoor room was created. The grading eliminated the problem of standing water and poor drainage, while providing light to the basement family room. 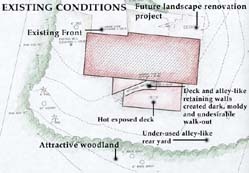 The excavated earth was used to build a retained mound that created both a link to the adjacent woodland and an anchor for the new deck. A catwalk connected this deck to the main level living room. The narrow profile of the catwalk virtually eliminated the visual interference of railings seen from the living room, and the entire composition resolved the integration of architecture and landscape. • Creating a dynamic, pleasing composition based on alignment, form and junctures. 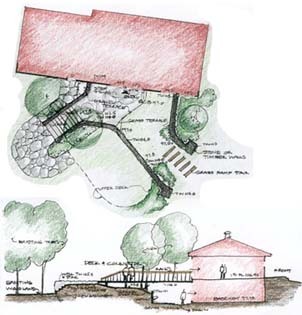 • Converting a flat yard into a multi-leveled and more intricate space. 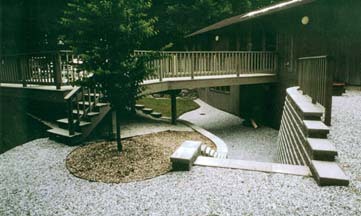 • Using inexpensive materials such as boulder and prefabricated concrete unit walls, designing simple but well-constructed decks, transplanting native species existing on the site and the woodlands walls, designing simple but well-constructed decks, transplanting native species existing on the site and the woodlands. 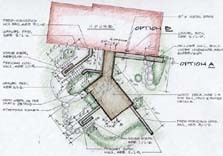 The result is an integrated rear yard that provides intimate, functional links between the upper and lower floors of the home as well as between the home and the adjacent woodland. At a cost of approximately $15 per square foot for the project area, this is a model for similar efforts. Modest funds spent in a strategic manner can contribute exponentially to the value of the property. Small but significant changes to the original concept simplified the final site plan, above. The design successfully accommodates and differentiates places of movement and landing. Links to the larger landscape. The deck, grass walk and stairs provide visual and physical access to the attractive woodland beyond. 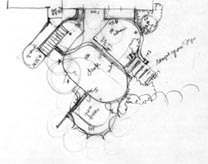 The design involved layered thinking from the beginning, as shown by this early sketch, above. The result is an intimate integration of architecture and landscape.